Update: Use this same process with beans and carrots. We’ve since made few new batches, each time playing with the spiciness and acidity. Dilute the vinegar with hot water to reduce tang. It seems in every food/yoga/restaurant magazine I read this season, everyone is all googly about canning or pickling the treasures of seasonal produce. Not that I’m ‘Anti’ canning, quite the opposite, but it’s a process. A serious process. And I’m not so into cooking with lengthy processes and steps. But when other people are willing to take this upon themselves, I’m more than happy to enjoy the fruits (or asparagus, as the case turned out to be) of their labor. When I originally signed on to pickle, I thought we’d boil a brine, marry asparagus and cooking liquid and screw on a top. I knew there was some boiling of water, and it was all supposed to take some time. “But what’s the big deal? !” I thought, I can do this, no brainer… Then the pickling began. I basically forced myself to finish these processes because I stupidly bought 8+Lbs of asparagus first. So I was financially invested in the project and was going to be very unhappy if it went to waste while I twiddled my thumbs and lost interest. First, you need stuff for this ‘pickling’. You’ll need an enormous pot, preferably with a metal contraption to keep your jars from smacking into one another. Then, you need jars, canning lids, canning tongs, clean towels and the brine ingredients. Holy smokes! Eddie’s mom is a culinary wizard, so thankfully it was a matter of us borrowing the necessities. Trim the cut end of the asparagus spears, and cut them into 3 inch lengths. Place them in a large bowl with 1/3 cup salt, and cover with water. Let stand for 2 hours. Drain and rinse under cool water, and pat dry. Sterilize two pint size wide mouth jars in simmering water for 5 minutes. In a saucepan over medium heat, combine the vinegar, sugar, 1 teaspoon of salt, mustard seed, dill seed and peppercorns. Bring to a boil, and simmer for one minute. Pack the asparagus spears, tips up, in the hot jars leaving 1/2 of space from the rim. Tuck one dill sprig and garlic clove into each jar, sprinkle 1/4 teaspoon of red pepper flakes. Pour hot pickling liquid into the jars, filling to within 1/4 inch of the rim. Wipe rims with a clean damp cloth, and seal with lids. Process in a boiling water bath for 10 minutes. Cool to room temperature. Check seals when cool by pressing the center of the lid. It should not move. You’ll hear the magical ‘pop’ of the lid as it seals. It’s quite satisfying. Store in a cool dark place. 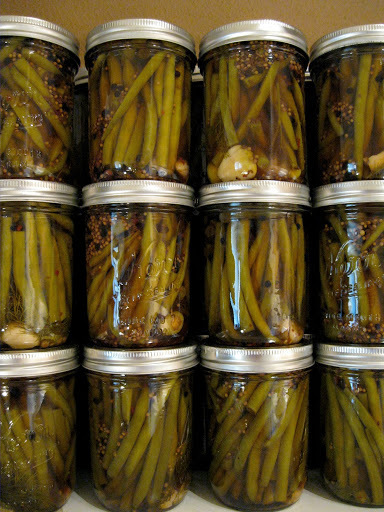 If any jars have not sealed properly, refrigerate and eat within two weeks.